Chapter 105 entitled The Elephant consists of five short verses. It was revealed in Mecca and scholars deduce from its historical background that it was revealed in the very earliest days of revelation. When Islam was first presented to the people of Mecca they were all non-believers. Although it was revealed for all people in all times, the Meccans were the first to hear the message. Yes they believed in God but had put intermediaries between themselves and God. The early revelations taught the people that God was One; He has no intercessors, partners or associates. The Elephant refers to a very famous incident that took place in the Arabian Peninsula in the same year Prophet Muhammad (peace be upon him) was born. It demonstrates how God protected the land that was to become the focal point of the last revelation. It is described briefly because it was an event still clear in the minds of those living in Mecca and the surrounding areas. The entire city had to be evacuated because of the coming aggression. Various historical reports tell us that the Abyssinians had expelled the Persians from Yemen. They established their rule there under the Abyssinian governor Abrahah. He established a splendid and expensive church in his capital because he had witnessed the love and enthusiasm the Yemeni Arabs had for their Holy House at Mecca, and he hoped to entice them away from there and to his capital at San’a. If the Arabs preformed the pilgrimage in San’a instead of Mecca, it would divert the economic benefits to Yemen. This did not eventuate and Abrahah was furious. He formed an army, which included thirteen elephants, with the intention of demolishing the Holy House. On his expedition he succeeded in defeating all the Arab armies until he reached Mecca. As Abrahah’s armies approached the city, God intervened. It is said that the lead elephant sat down and refused to move towards the city. The elephant trainers tried all they could to make the elephant move but he refused. When he was encouraged to move in a different direction the elephant cooperated but when turned towards Mecca he refused. 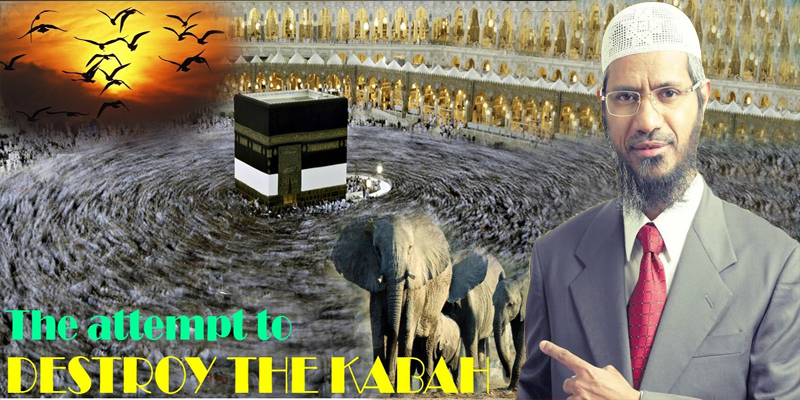 God addresses Prophet Muhammad, asking him, have you not seen how your Lord (God) dealt with the Army of the Elephant? God is asking Prophet Muhammad, don’t you remember, don’t you realize? The punishment of God is not limited to the Hereafter and this event is an example that God can inflict punishment at any time. This question also draws the reader’s attention to the incident and thus stresses its great significance. This incident was so well known to the Arabs that the year in which it occurred came to be known as the Year of the Elephant, and they used to use it to describe various lengths of time. It was as if it was their calendar. For example they would say this thing happened in the year of the Elephant or it happened two years before the year of the Elephant. And this was also the year in which Prophet Muhammad was born. Next, God abbreviates the well-known story in the form of a rhetorical question. Did He (God) not cause their treacherous plan to be futile? Any plans made by the People of the Elephant were useless and incapable of achieving their desires because their plans were not God’s plans. Although they set out with a destination and an outcome in mind they were like people lost and wandering, their destination was out of reach. The Meccans were too weak to face the aggressors but God took it upon Himself to protect His Holy House. He reduced their nefarious plans to nothing. The Quran then brilliantly portrays how the aggressors were defeated. God sent against them flocks of birds that pelted them with pebbles of sand and clay. Islamic historians say that the birds were of all different kinds, some never seen in that area before. In addition to this they came from every direction. Those who could remember the event described the birds as filling all of the sky, as far as they could see. The birds did not each throw one pebble; they had pebbles in their beaks and in each of their claws and they fell like rain, one after the other. The pebbles were thrown from such a height that it is said that they went straight through their skulls. This event suggests that God did not want the responsibility for protecting His House to be taken out of the hands of the Meccans. He directly intervened to repel the aggression by a stronger force. God was preparing the way for His religion before the birth of Prophet Muhammad and long before he began to spread the message. This is followed by a vivid image describing the aggressors as being devoured like dry leaves. In other translations they are described as looking like the windblown died straw that animals chew on. Islamic historians tell us that Abrahah survived the attack and fled back to San’a. By the time he arrived his body looked as if it was diseased, with wounds everywhere and skin falling off. Normally when an army is defeated, they make plans to avenge that defeat but the condition of Abrahah meant that they were severely afraid to return to the area.